The banner is a symbol of victory. In a war, when one side captures the others’ flag/banner, they can claim victory. 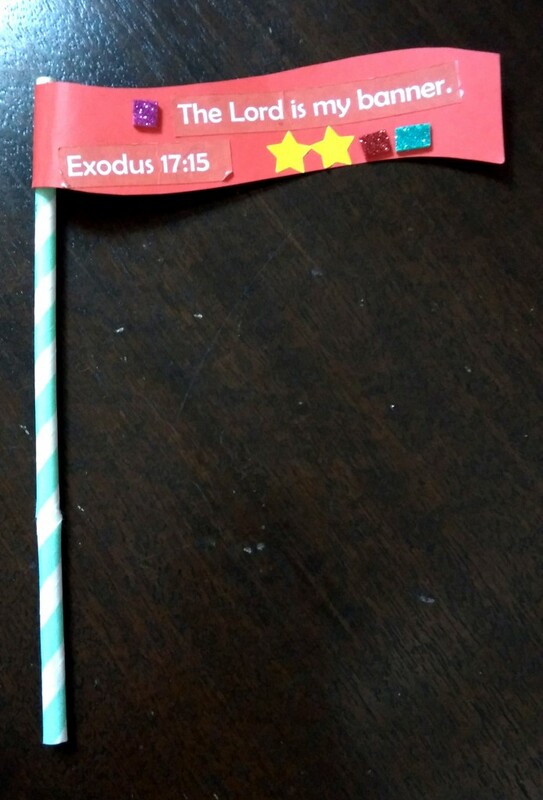 When Moses stood on that hill and raised his staff, the staff was like the flag/banner for the Israelites. As long as it was raised high, the Israelites fought more boldly and confidently. But when it started dropping, their spirits fell too. So Aaron and Hur held up Moses’ arms, one on each side. This banner in the hand of Moses was a visible image of God’s presence and power. He was the one who would provide the victory over the Amalalekites. By themselves, the Israelites were sure to be defeated and destroyed. But with God, they could be victorious! Jehovah Nissi: The Lord is our Banner! What shape do you see when Moses stands up there with his hands stretched out, holding his staff? Today, the Cross is our banner, our flag, our victory. When we see the Cross, we remember Jesus’ death and finished work on the Cross. Jesus won the victory over sin and death for us! And unlike Moses’ tired arms, Jesus does not get tired or weary. His work on the Cross stands forever — His victory is forever. So no matter what problems and challenges we face, whether it’s not enough food or an enemy’s army, we can look at the Cross and know He has given us the victory!